Let’s play a game. You choose any cleaning product on the shelf at your local market and tell me what’s in it. Easy, right? All you need to do is read the label. There’s only one problem – ingredients are not required to be listed unless they’re already known to be harmful, and pretty much no one’s checking to find out if they are. A study done by the EPA found that about 85% of chemicals approved don’t come with any safety data. (Alderton et. al.) However, when evaluated by independent third parties, many of the cleaners on the grocery store shelves are found to contain neurotoxins, endocrine disruptors, and carcinogens. (EWG) That’s not good for us our our environment, which is why there’s been so much demand for safer options lately. Problem is, just because something has a green leaf or a recycle logo slapped on it does not mean it’s truly safe. 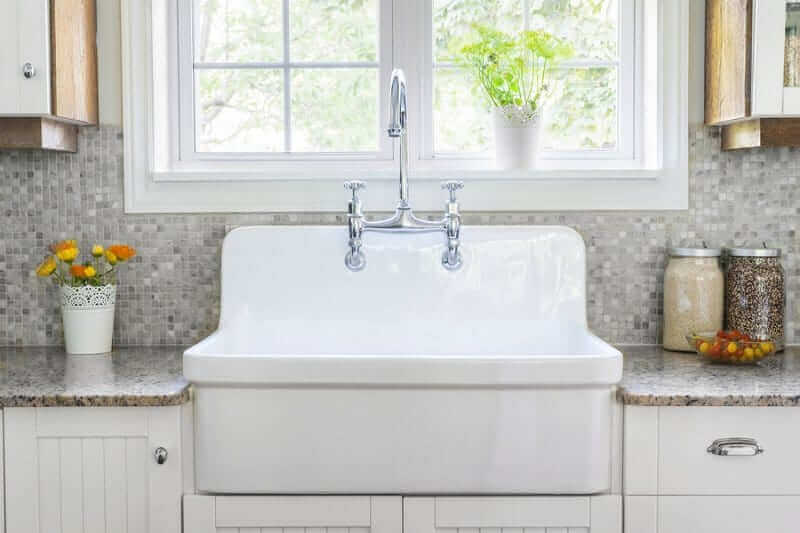 Below are twelve non-toxic cleaning recipes that really work, plus what to buy when you don’t want to DIY. As you’ll see, there are several brands represented because I chose each product based on ingredients and not the manufacturer. Some of these companies include problematic ingredients in other products, so make sure to read the label before popping them in your cart. 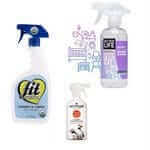 I use these cleaners on kitchen counters, the dinner table, the bathroom counters, and for dusting. 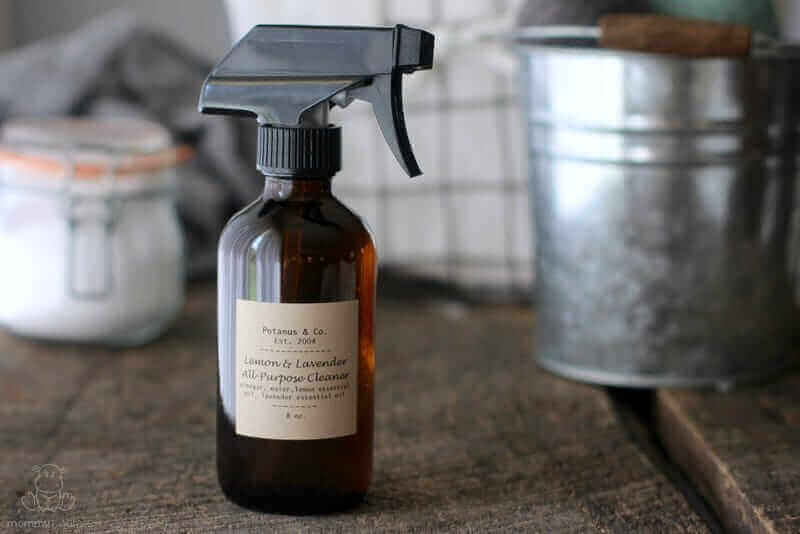 DIY All-Purpose Cleaner With Lemon And Lavender – The bright, fresh scent of this all-purpose cleaner is perfect for everyday use and spring cleaning. It’s super easy to make, too. Citrus Splash All-Purpose Cleaner – This simple mixture smells fabulous, but don’t let its great smell fool you – it’s amazingly effective! Tip: Essential oils are wonderful to clean with, but unfortunately they may cause plastic bottles to leach. No worries, though, it’s super easy to make your own glass spray bottle. 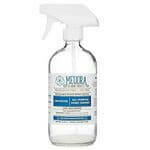 Meliora All-Purpose Cleaner – This company uses the absolute purest ingredients. When you buy the glass spray bottle found here it comes pre-loaded with one batch of powder, so all you have to do is add warm water and shake until dissolved. You can order 18 refills on the same page for the cost of about $0.71 per 16 ounce bottle including shipping. 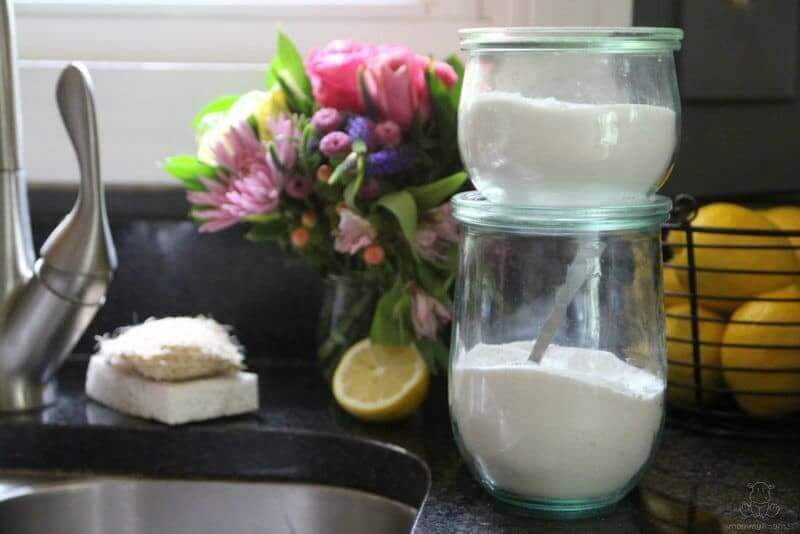 Homemade Dishwasher Detergent – If you’ve ever tried making homemade dishwasher detergent and been disappointed with the results, chances are you were closer to a great recipe than you thought. Most DIY formulas use the same basic ingredients, but there’s a trick to getting them to work. Natural Dishwasher Rinse Aid – Hard water deposits and sediment are no problem for this natural homemade dishwasher rinse aid. It’s easy to make, too – you only need ONE ingredient! – Although I have a liquid dish soap recipe that works beautifully in my kitchen, it doesn’t seem to produce consistent results due to regional variations in water types (hard water, soft water, pH, etc.) 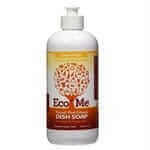 The Eco-Me liquid soap gets an A from the Environmental Working Group and works well on greasy pans and dishes. – When I set out to find a store-bought alternative to my homemade dishwasher detergent, I thought for sure the best option would be another powdered detergent. Turns out, though, that this liquid gel is one of the highest rated for both safety and performance. 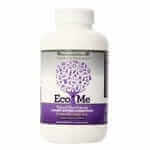 Eco-Me Rinse Aid – This rinse aid is made with just four ingredients – vinegar, citric acid, coconut-derived soap and plant-derived solubilizer – the soap and stabilizer both score a “1” with the Environmental Working Group, which is the safest rating possible. – A lot of rinse aids get an “F” from the Environmental Working Group due to the use of toxic ingredients and not disclosing the full ingredient list. Ecover, on the other hand, earns an A. Natural Laundry Detergent – Here’s what a couple of y’all have had to say about this recipe. 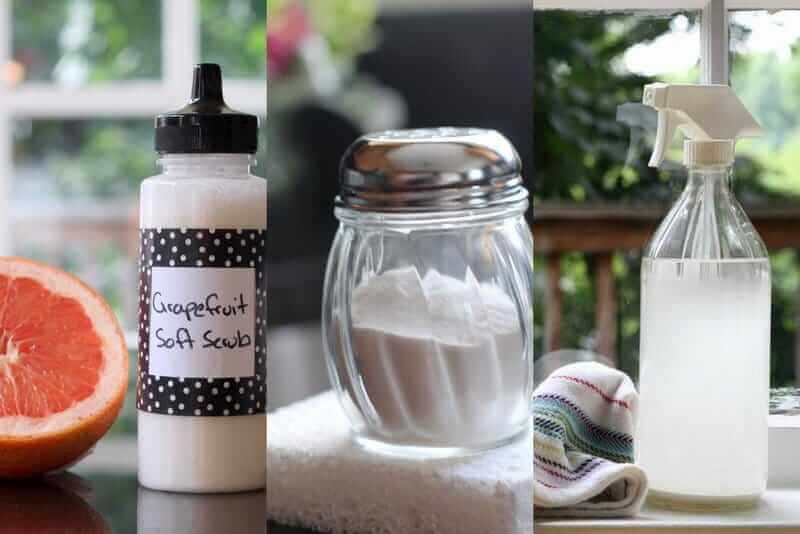 Homemade Bleach Alternative – If finding a homemade bleach alternative that WORKS feels a little like hunting for a mythical laundry unicorn, I think you’ll like this simple recipe. 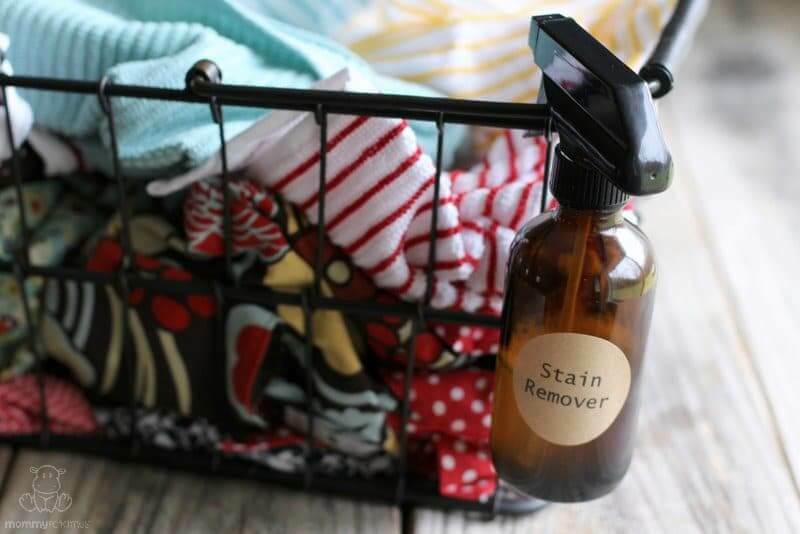 Homemade Stain Remover – As my kids have gotten older – and MESSIER – I’ve found that my old stain remover recipe just couldn’t cut it. After testing several variations, I’m loving this one. It’s worked beautifully on ketchup, grass stains, oil stains, and those mystery stains you don’t notice until something has already been washed and dried. Homemade Wool Dryer Balls – They reduce drying time, soften clothes without chemicals, and save money. Meliora Laundry Powder – Very similar to the formula above, comes in unscented and lavender. 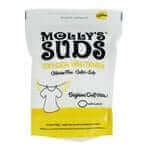 Molly’s Suds Oxygen Whitener – This is very similar to my bleach alternative recipe with the addition of enzymes that help with whitening. 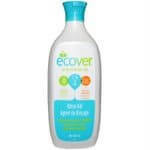 Eco-Me Natural Laundry Whitener Brightener – This is very similar to my bleach alternative recipe and the formula above except it uses enzymes that help with whitening instead of essential oil. 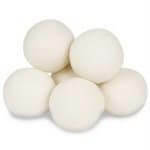 Dryer Balls – I like these eco-friendly wool dryer balls because they’re well-made and affordable. 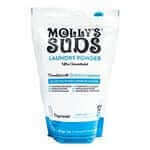 Stain Removers – It’s pretty challenging to formulate a really clean stain remover. Fit Organic Laundry & Carpet Stain Remover has the best ingredients that I know of but is not great at getting tough stains out. 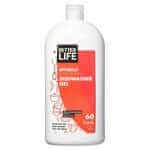 Better Life is more effective in my opinion, but it contains a tiny amount (0.01%) of a preservative I don’t love because it’s associated with allergic reactions. Attitude Stain Remover‘s ingredient looks a lot less natural than the others, but it’s actually rated higher than Better Life’s by the EWG and works pretty well. The only downside is that you’re supposed to treat the stain immediately, not spray it and set it aside to wash later. 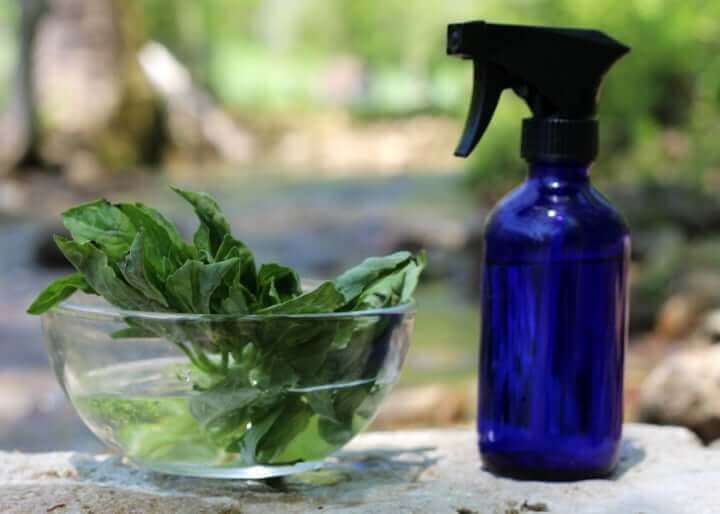 Streak-Free Homemade Window Cleaner – It’s easy, it works, and the most popular store bought brand gets a D from the Environmental Working Group. Skip it and make your own instead with this quick and easy recipe – or buy the safer option below! Homemade Soft Scrub – Wipe away grime and restore shine with this gentle soft scrub. It works just as well as store brands, and chances are you already have the ingredients to make it! Toilet Scrub – Mix 1/2 cup baking soda with 8 drops lemon or tea tree essential oil (if desired) and sprinkle into toilet bowl. Allow the mixture to sit for about 30 minutes, then scrub. 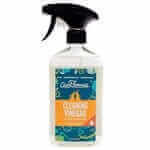 Attitude Window & Mirror Cleaner – This brand gets an “A” from EWG and actually works. Sonnet Organic Scouring Powder – Uses the gentle action pumice powder with sodium carbonate, clay, soap derived from plant oils, and natural essential oils of sage and cajeput to clean without causing scratches. GreenShield Certified Organic Toilet Bowl Cleaner – Naturally scented with organic essential oils and gets an A from the Environmental Working Group. 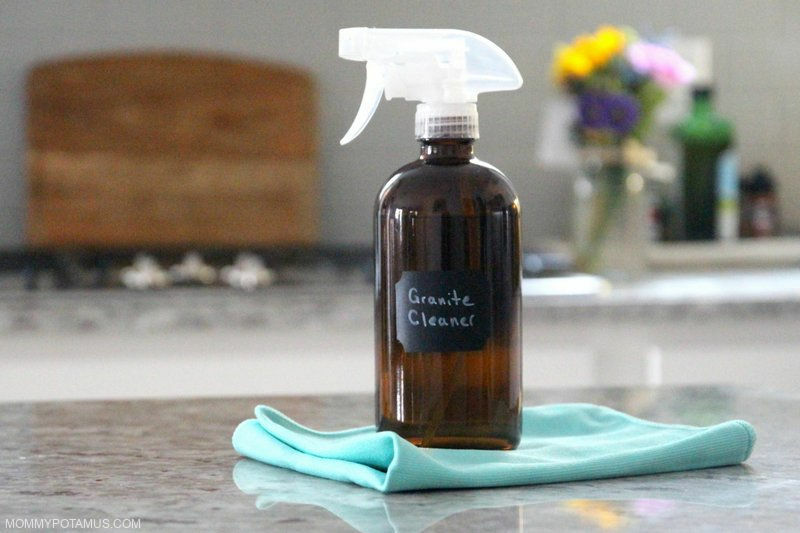 Non-Toxic Granite Cleaner – This natural homemade granite cleaner won’t etch countertops like vinegar or lemon juice, and works beautifully without leaving streaks or a filmy residue. So easy to make, too! 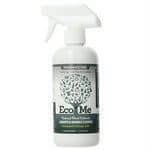 Eco-Me Granite And Marble Cleaner – Although this one is not specifically rated by the EWG, it contains two plant-derived soaps that are rated as an A, plus aloe vera, radish root ferment (which is antimicrobial), and a food-grade preservative. Twist Scrub Sponges – I love these natural, compostable sponges. They work well and be run through the dishwasher for easy cleaning. Microfiber Cloths – Perfect for dusting, mirrors, countertops, everything! 1. Alderton, Steve. (2010, February) EPA Needs a Coordinated Plan to Oversee Its Toxic Substances Control Act Responsibilities. Retrieved from https://www.epa.gov/sites/production/files/2015-11/documents/20100217-10-p-0066.pdf. Thank you, Katja! I often use vinegar to clean my counters but I’m going to switch to rosemary and lavendar . . . instant aromatherapy! I’m a huge fan of those cleaning supplies and made the switch after having Evan. Well, I started making the switch while I was pregnant b/c store bought cleaners were making me sick. I make our laundry detergent too. Great post! May I ask what brand of concentrated orange oil you use and where do you get it, please? I have never heard of Citra-Solv, but now I am really interested. I’m looking for something I can add to our laundry as a sort of laundry booster. We regularly have grease spots show up on shirts, but we don’t usually notice them until after the laundry is done and we’re hanging up shirts. At that point, I don’t want to take the clean shirt back to stain treat it and wash it again. Is Citra-Solv something I could add to laundry as an extra degreaser? This is EXACTLY the post I’ve been looking for! I’ve been wanting to take my cleaning efforts green for some time, but felt like it would take way too much time and energy for my already over-committed lifestyle. Two spray bottles and some baking soda? I can do that. Don’t know that hubby will be ready to go completely paperless yet, but the chemical-free cleaning is certainly a step in the right direction. Thank you! love this! We use vinegar A LOT in this house. But, looking forward to mixing up those other items! Thanks Mommypotamus & Katja! ROFL–Heather, Josh told me how you weren’t the same then…lol I didnt go all crazy about this stuff till having Evan and he has bad allergies and very sensitive skin and I will not do anything to make him worse!!! What I do may not cure him, but at least I’m not making him worse!! My daughter also has a lot of allergies and very sensitive skin. For us, gluten-free/dairy-free (though she’s fine with eggs) was the answer. If you’re interested, I’m happy to talk more about it offline – katja at katjaswift dot com. Thanks so much for this post. I’ve been using vinegar a lot to clean the counters, but I’ve had trouble getting away from my other chemicals. I never really cared before but when I got pregnant I started to realize how many chemicals I was using all the time. I’m looking forward to getting another spray bottle and essential oils to clean with! But what is the best way to dispose of all of those unused bottles of poison under my sink? You can take them to your local fire department as a hazardous material, but they’ll probably laugh at you. I think I would try it anyway. Or if your community has a hazardous material pick-up day through your waste disposal company, take them then. I was wondering if these essential oils have to be rinsed with plain water after cleaning? Are they safe to use around kids and pets? What is your opinion regarding lavender and tea tree oil as estrogenic? I have tried to stop using them as I have read this. I will still use them on occasion, though, as they are better than the toxic alternative. My opinion is, it’s complete hogwash. This kind of research is very common. They want to prove something is estrogenic, so they adulterate it with a known estrogenic before using it. Or in the case of aspartame – they incorporate into the controls other elements that mimic the behavior of aspartame, so that the group using aspartame looks the same as the controls. It’s true that essential oils are very strong, which is why we only use them in drop-doses, and almost never directly on the skin without dilution. But estrogenic? Bogus. PS: as i’m looking back at this, of course, a long time after i wrote it, i realize – i meant to put some smiley faces in there or something! Mr Yuk is still around (we just picked some stickers up, actually). But thankfully we won’t have to put his nasty face on much since we’re rocking the non-toxic alternatives. 🙂 Thanks for this post & all of the great suggestions! Thank you so very much for this link! Nobody has been able to give me any information on this and I honestly hadn’t looked into the study. Should have, I know. For scrubbers, I grow my own loofa in the garden. Super fun plant, and produces LOTS of “sponges”. It is the only thing I use for dishes and bathtubs, and it never gets moldy or yucky. Obviously you can compost it because it is a plant. I have LOTS to share, because they last forever. 🙂 If you don’t want to grow your own, you could just use the ones sold as exfoliators in the beauty supply store. I used to think that they were ocean plants, but they aren’t! I thought they were ocean plants, too! Definitely going to have to check this out. So grateful for this article. I keep telling people “one day i’m going to get chemicals out of my house” – and that one day hasn’t come yet. I’ve been looking up hundreds of natural substitutes for this, that, and the other – wondering how on earth it could be affordable! This looks super easy and manageable – I could make this up in 15 minutes spare time this weekend! Thanks! She lectures at Dartmouth and University of Vermont Med Schools???? Really???? Did anyone verify this? I know of no conventional med school that has routinely had guest lectures presented by un-credentialed herbalists. I totally support alternative practitioners that did their own research and don’t necessarily have what the conventional medical community would consider as credentials, but this just doesn’t add up. I hope it’s true, that would be awesome! You can contact Dr. Lana Dvorkin-Camille, if you’d like a reference. It’s very encouraging, how far the mainstream world is coming! I used the water with rosemary and lavender on my (kind of sticky) kitchen counter today – after giving it a try with a bit of warm water and dish soap. It worked SO WELL! Thanks again for the simple, effective tips! Thank you!! You always provide such wonderful helps!! Good point! We do use toilet paper most of the time – I should edit it to include that exception! I have known families to include toilet paper in their zero-paper policy, though. Washcloths would work fine, though at that point, you’d be creating really a *lot* of extra laundry, so I’m not sure about the tradeoff. When I lived in Russia, we often didn’t have toilet paper – sometimes there was leftover newspaper, or sometimes nothing and you just had to wash your hands really well afterwards! thanks so much for this post! I’ve been using the lavender & rosemary spray as an air freshener since you’re last guest post. I loved it so much that I made some for two of my neighbors and they LOVE it. I’m anxious to try your other ideas. I live just around the corner from you in Dedham and I’d love to attend a lecture if they’re ever open to the general public. thanks again! Hi, Jennifer! Thanks for the comment! And yes – I teach to the public lots and lots! Check out our complete class listing at http://www.commonwealthherbs.com – coming up there’s an Herbal First Aid class, a class on Lyme Remedies, one on Post-Partum and Infant Health, a Musculo-Skeletal class, and one on “detox” (such a loaded word today!) I’d love to meet you in person! of course I should have done this before I commented, but I just looked at your website and see all the classes that you offer. maybe I’ll try to sign up for a Saturday class soon. thanks again for all the tips! Mix and store in a mason jar under the sink. Use one tablespoon full for every load. Add plain white vinegar to the rinse section of your dishwasher. This really works! My dishes smell clean and I feel better about helping my family and the environment stay healthy. You have to rinse dishes though, you can’t leave caked on stuff. I had to rinse with the commercial brands of dishwasher powder anyway, because my dishwasher is old. BTW, love your website, I read every week without fail! Thanks for the recipe, Julie! How much water do you use for the all-purpose cleaner? I have a 24 oz spray bottle, should I just fill it all the way or is that too diluted? Hey! Thanks so much for this post. I use vinegar as a cleaner but it smells so strong, even with lemon in it. I want to try the rosemary lavender combo instead, but my mom is super allergic to lavender. She watches my son twice a week at my house so I might need something else. Any alternatives to the lavender? I know you said the strong-but-simple rosemary-lavendar water shouldn’t fool us, but I was wondering if there would be any reason not to add some vinegar, just for something a little extra than the water. I’m looking for an alternative to Lysol or antimicrobial Febreze (I didn’t see a recipe in your book specifically for a similar fabric spray to kill germs on things like the couch or down comforters between washings). Also, I know this is an older post, and you probably did a lot more research for the new book since then, but I wondered what the difference/benefits of the new ingredients are for your window solution, compared to the simple one listed here. Thank you so much for all your helpful info! Sorry, I forgot this was a guest post. So I guess this is kinda directed at you and/or Katja. But I’d love to know your thoughts, from either of you, either way! You said in your post about washing dishes with a little vinegar and hot water-do you mean that you do not use any dish soap? Do you add anything else to the dishwater to clean dishes? It is hard to get past the idea of having no bubbles to “clean” the dishes with! But it would be less expensive, and not harsh to the skin. 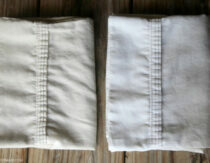 I started using microfiber cloths for most of my cleaning and as paper towels! Love it! Quick question…what do you use for toilet paper? Do the essential oils mix with the water in the spray bottle? Don’t they need some kind of dispersant or should I shake the bottle when I use it? Have you ever tried using Norwex cloths? All you need is water! I LOVE their stuff! Is the toilet bowl cleaner a disinfectant? I would love to ghp more natural, but also want to make sure I’m really disinfecting areas like the toilet. ? Hi There, I appreciate this list. Do you have an article or somewhere to point us to know the ingredients that are disqualifying cleaning products on your list? I would love to read the ingredients and know what I’m looking for. Thanks! Is there another dishsoap you recommend? The one suggested is no longer available. Thanks! Hi Nikki, are you talking about the Eco-Me one? When I click on the link it looks like it’s in stock. Thank you for the information; having a clean home is so refreshing and knowing that you can get this clean with natural cleaning products that are non-toxic is reassuring. 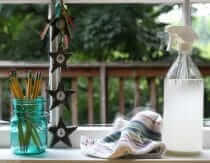 Your guide as to what natural cleaning products to buy-and which ones-and what ones to make yourself is very helpful.